1 million pieces of US Government owned equipment still in Iraq! Imagine the most difficult PCS you ever faced? I remember one that was so complex it makes my head hurt! We had most of our household goods going into temporary storage and some into long term storage (3 years) and a small amount being flown to the overseas PCS location. We had to have family travel stuff and I was going to school and had personal items and professional goods being shipped to that location. I am sure my director of logistics (my bride who experienced 18 PCS moves) would have more details but then I took off to school! She rented the house, did the move , found temporary living quarters and met me later at our assignment! Now imagine the role and responsibility of Maj General Thomas Richardson, the J-4 Director (logistics) of US Forces-Iraq with 1 million pieces of US Government owned equipment still in Iraq! He has to direct the sorting of the equipment into multiple categories with multiple destinations! The process began with Operation New Dawn last September 1st. 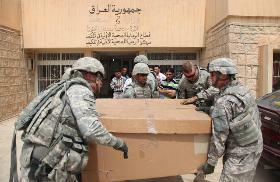 One point seven million pieces have already left or been transferred to the Iraqis. We met with Gen Richardson during a DoD Bloggers Roundtable as he described his role and what the drawdown in Iraq looks like! I asked him if the nasty next door neighbor (Iran) was having any impact and he said no despite Admiral Mullen’s recent demand that Iran stop interfering in Iraq. Patterson did emphasize that force protection was the number one priority during the drawdown! He also said they were going to be “good stewards of American taxpayer dollars” as they continued New Dawn’s efforts to relocate and process equipment! With an original 94 military locations/installations in Iraq, the process has reduced that number to 48 today with 7 to close in August. This is a busy man and team! I laughed at “FOB in a Box”, what he called the logistics folks description for the closure of a forward operating base and its equipment. Equipment that had to be relocated to Afghanistan, other CENTCOM locations, transferred to the State Department or other government agency, returned to the US or given to the Iraqis according to a US Law passed by Congress. Imagine jersey barriers, porta johns, tents, dining facilities, washer/dryers, refrigerators, fork lifts, fire trucks, etc. that need to be sorted and shipped! I asked him how much it was costing to ship equipment and he did not have that information. He did have other statistics that showed the value of our equipment, how much had been moved in dollar value and other critical information. If you are interested in those specifics, please listen to the audio or read a transcript of the Roundtable at DoDLive! In the meantime, as you plan or work through that next PCS yard sale, sorting of personal items, professional goods, travel clothes, etc., best wishes for a successful move! 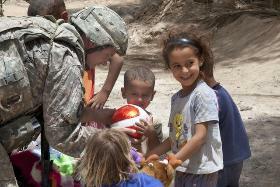 Military has many resources to help you from checklists to schools in our Moving Tools section! You can find other helpful PCS blogs as well in Our Letters to You! 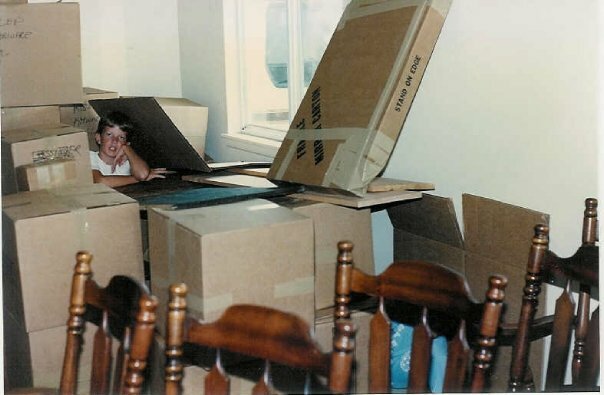 PCS Fun with cardboard boxes and furniture! MilAve Dan!